A delicious recipe from Sandra Kemna, completely Weight Watchers proof. She has included Greensweet Brown. Spray the wok with some PAM spray and fruit in it the onion, pepper and garlic. If it gets too dry, add small amounts of water and no grease! 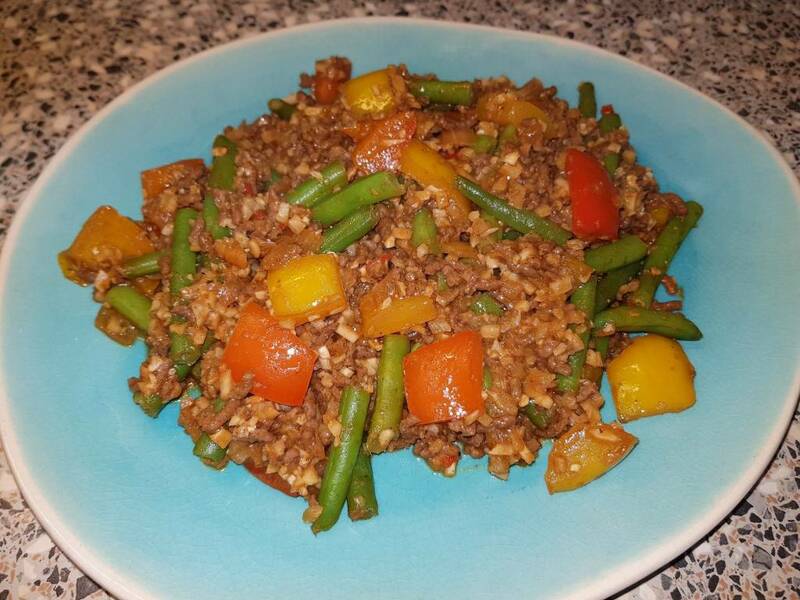 Add the tomato puree, fry briefly and add the sweet soy sauce and the soy sauce, stir together and add the mince. Rubbish the mince with a fork in the soy and soy sauce water (you will be surprised how good that rult in some moisture. Add the peppers, ginger, sambal and Greensweet Stevia Brown and stir fry for a minute. Add the peanut butter with a little water (100 ml) and mix. Then add the cauliflower rice, the Chinese 5 herbs powder, the crumbled maggi cubes, the djinten and the paprika powder. Stir fry together. Finally the pre-cooked green beans are added. Stir fry completely for another minute or 3. The green beans must keep their bite.